How do you tell kids their dad is dying? When my son was very small, I walked past the kitchen and saw that his goldfish was swimming sideways – never a good sign. It was a hot sunny day and I went outside to where he was sitting with his dad. “Your goldfish isn’t feeling very well,” I said signalling to his dad, Stanley, to go and get rid of the evidence. Alex followed his dad to the kitchen and I met him on the way back down the passage. I was worried about how he would take the news of an unwell goldfish. How much would I have to explain about how some things get sick and then they die, and we can only remember them? Right, I thought, a little realist. I didn’t know then that within far too few years I would find myself explaining to the same little boy, sitting in his school uniform in the secretary’s office that his dad was going to die that day and that he had to go and say goodbye to him. It was the last day of school and he had his report in his hand, “Can I read Dad my report?” he asked. Talk about the question that almost breaks the mother’s back. Everyone’s experience of dealing with death and children varies, and I don’t for one moment believe that I got it right, or that our way of dealing with knowing that my husband had at most a week to live was the only way or the right way. It was, however, the only way that made sense to me. We told them. Alex was in Grade 2, Hannah in pre-school and Grace was 4. We sat on their dad’s bed and explained that he had an illness that the doctors couldn’t fix and that soon he would die, and we wouldn’t see him again. But we told them, that he would watch over them (you’ll have to decide your position on that -- as Christians we believe it to be true), but that they would never see him on earth again. My reasoning, if reasoning is a term that you can apply when you are confused and scared, was that it would be less scary for them to be told what was going to happen, than for them to hear platitudes and whispering behind closed doors. After all the end result, however, we dealt with it was going to be the same: within days their beloved dad would be dead. And so, with the help of good friends, we explained to the children what was going to happen, we kept the physical detail down to a minimum and made sure that they didn’t see him when he was in great physical distress, although once we had him on oxygen and morphine things were pretty calm. We sat on the bed around him and sang silly songs. The girls spent one night cuddled up on either side of him. And on the last day of his life we gathered in a circle around him on the bed and Alex read him his report and they sang Amazing Grace (which I suspect my youngest daughter thinks was written for her). My friends were good at picking up the clues the children gave them non-verbally, at one point Grace repaired to the couch and seemed to sink into herself, her Godfather Luke made no attempt to cheer her up, he just covered her with a fluffy blanket and kept a watchful eye. They helped plan the funeral and they came to it. For me the day is a blur we sang Amazing Grace, we sang Rock of Ages, we sang Jesus Bids Us Shine, which might have fazed the organist but didn’t. My children are perhaps more aware of death than others, they have had the odd wobbles, but on the whole I think they came through it pretty well, well , as well as you ever do when your daddy dies. Did we do death right? I hope so, at least no one lied to them, but in the end as I said the result was the same, they will never have a father in this world. 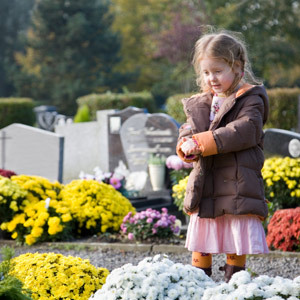 How do you tell children about death when it strikes close to home?